At FreeYum, they know there's nothing quite like seeing the delight on a child's face as they bite into an allergen-free treat that's so yummy, all their friends want a bite too. They've been there, and they want to share that feeling with you. 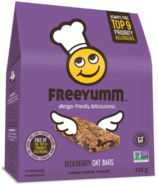 That's why they make their FreeYumm bars and cookies with natural ingredients in a dedicated bakery where the top eight priority allergens are never allowed. Unhealthy fillers here? No way! 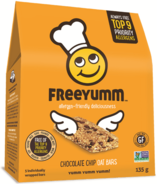 They're careful to leave out the artificial fillers that some gluten- and allergen-free products include to lower costs or make up for lack of flavour. 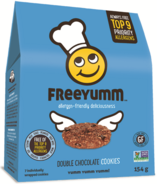 Their treats simply don't need them, and they trust you'll agree. What about highly processed sweeteners? 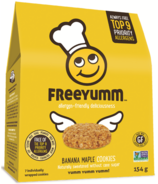 You won't find them in FreeYumm! With so many health issues associated with highly processed sweeteners and cane sugars, they choose to use natural, unprocessed sweeteners. In fact, you won't find any fillers, refined sugars, or preservatives in their bars or cookies. FreeYumm makes sharing yummy food with family and friends so much easier... and more fun, too! So grab some anytime, anywhere, and share the yumm!